Mattifying Oil Control Moisturizer Review: Is It Safe To Use? 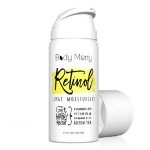 Formulated with Clarifying Neutralizing Complex and oil-balancing micro particles, this moisturizer claims to help protect skin from UVA-UVB sun damage, while controlling shine and mattifying imperfections. 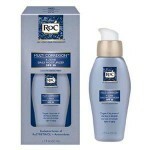 It is specifically formulated for blemish-prone skin and said to be comedogenic (won’t clog pores). Read our complete Mattifying Oil Control Moisturizer review to know if this product is a valuable addition to your skin care arsenal. Doctor’s Dermatologic Formula (DDF) was created by Dr. Howard Sobel. For over 25 years, the company has brought dermatologic approach to skin care. That is why DDF tackles the root causes of skin problems rather than just treating the symptoms. 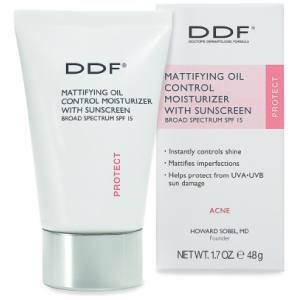 DDF’s top products include anti-aging preventive, anti-aging restorative, acne-fighting solutions and formulations specially created for sensitive skin. To use Mattifying Oil Control Moisturizer with Sunscreen Broad Spectrum SPF 15, apply a generous amount to skin at least 15 minutes before sun exposure. Re-apply at least every two hours. With Hazel: It is a natural astringent and rich in powerful antioxidants. It speeds up the skin’s healing process, stops cellular damage and gets rid of bacteria lurking within the pores of the skin. Vitamin A (Retinyl Palmitate): Due to its tiny molecular structures, Retinyl Palmitate has the ability to penetrate skin and repair the inner layers where collagen and elastin dwell. It helps boost collagen and elastin production, replaces skin previously damaged by acne and promotes skin cell renewal. 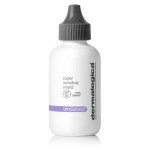 It is also a gentler form of retinol that is often used for sensitive skin types. Aloe Vera, Marigold and Ginger Root: Helps calm irritated skin due to breakouts. 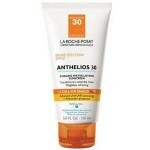 Contains UVA/UVB broad spectrum SPF 15 to protect skin against sun damage. Leaves skin hydrated, plump and matte. Oil-free and non comedogenic formula. It contains a number of harmful chemicals. There are reports that it can cause skin irritation or allergic reactions. It contains parabens (Ethylparaben, Methylparaben, Propylparaben). Results don’t last; you need to re-apply frequently even if you are not swimming or sweating. 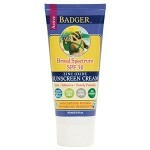 Mattifying Oil Control Moisturizer with Sunscreen Broad Spectrum SPF 15 is an average formulation. There’s nothing special to it. It has mixed reviews, but generally, the disadvantages outweigh the advantages. While it can effectively control shine, it doesn’t last long. It has low SPF content as well, so you really need to re-apply frequently. But probably, the disadvantage you should be concerned with is the use of harsh ingredients in its formulation that may cause skin sensitivity, irritation and long-term side effects. Check other sunscreen with better oil control and higher SPF. DDF offers a 60-day Satisfaction Guarantee.